This week: growing tomatoes under LEDs, a maker of nanotech heatsinks, and a major player reportedly downsizing its LED operations. From time to time, we'll dip into announcements of new LED products to sample how high the waves are lapping on the LED efficacy front. This announcement comes from Philips Lumileds, sponsor of this site: The LUXEON 3535 2D is a mid-power LED product line delivering 140 lm/W in a range of color temperatures, with CRI above 80 and R9 above 0. It features two LEDs per package to enable lighting designers to reduce the LED count, and the cost, for a given level of performance. If you live in a cool climate and like to eat tomatoes year-round, as I do, there's hope for growing the plants locally and avoiding the carbon impact of shipping fruit 1,500 miles. 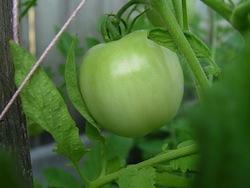 Researchers at Purdue have measured the effect of LED lighting on tomatoes grown in greenhouses. The verdict: The plants grew as well and yielded as much fruit as when grown under high-pressure sodium lamps, as is traditional. The energy saved was 75 percent. The LED towers, far cooler than sodium lamps, could be placed close to the plants without scorching them. "The leaves are photosynthesizing on the lower parts of the plants, and that may be helping with the plant's energy," one of the researchers said. Read the two following notes as tea leaves from which to glean information about the state of the LED industry. The market is still quite fragmented, so easy to enter. There are lots of emerging technologies and a lot of companies looking for solutions. If I wanted to get into automotive electronics, it might take two years to get approval. But because LED is so competitive, people are a lot more willing to accept emerging technology that will give them more lm/W. The Wall Street Journal relays a report from Japan's Asahi Shimbun (I couldn't find it on that newspaper's English-language site) that Sharp Corp. is considering scaling back its LED business. Sharp entered the business in 2008, and in recent years has been near the top of the list of companies filing for patents in the optics field. But its LED products, leading the market in Japan, have struggled to maintain profitability in the face of "stiff price competition with Chinese and South Korean rivals," according to the Journal. Companies in this vibrant and fragmented market will experience the full measure of creative destruction as prices fall while demand continues to rise.